New Haven is a city of unseen rivers. In addition to sitting on the shores of the Long Island Sound, it is part of three separate watersheds—water runs off into three different rivers that run through the city: the Quinnipiac River, the Mill River, and the West River, the last of which is twenty-five miles long and, in New Haven, largely out of sight of the city dwellers. “Some people honestly don’t even know that the river exists,” said Kendall Barbery, the Green Infrastructure Program manager at the Connecticut Fund for the Environment/Save the Sound. Yale, for its part, only widens the gap between people and the river. The athletic complex cuts off river access by cutting off the path trailing the West River with a large fence; while a sign reads, “PUBLIC ACCESS TO WEST RIVER: SUNRISE TO SUNSET,” the gate is padlocked shut. It should be no surprise, though, that locals have looked away from the rivers—for centuries, they have been sites of serious pollution, continuing up to the present day. Each year, an estimated fourteen million gallons of untreated sewage flow into the West River, which runs through Bethany, Woodbridge, and New Haven before emptying into the harbor. The overflows are caused by storm water runoff: in cities and suburbs, where the soil is typically obstructed by layers of cement and pavement, the runoff can’t permeate through to the soil. It either floods the streets or is directed to a management system via downspouts and gutters. In New Haven, the sewage and storm water systems are one and the same, leading to combined sewer overflows, or CSOs, during storms. Storm water combines with sewage as it flows into the pipes, which are designed to overflow into the river when they exceed the sewage treatment plant’s capacity. And even before the storm water makes contact with sewage, it is a source of pollution: it brings with it all the debris and pollution it has picked up on the sidewalks and streets, including chemicals, fertilizer, antifreeze, and animal feces. And the few residents who do regularly interact with the river tend to be those who use it as a source of food—they fish in it and crab in it, unaware that their dinner has been swimming in sewage. The few residents who do interact regularly with the river tend to be those who use it as a source of food—they fish and crab in it, unaware that their dinner has been swimming in sewage. In an effort to alleviate pollution in the West River and reconnect residents to the river, local organizers have created a plan to bolster New Haven’s grey (i.e. traditional and man-made) water infrastructure with green infrastructure inspired by the Earth’s natural system. On the border of Edgewood Park runs Westpark Avenue, one block of which is lined with plant beds that look like miniature secret gardens, with small clusters of trees and plants framed by stone blocks and little rails. These are bioswales: landscaping elements that collect rainwater. 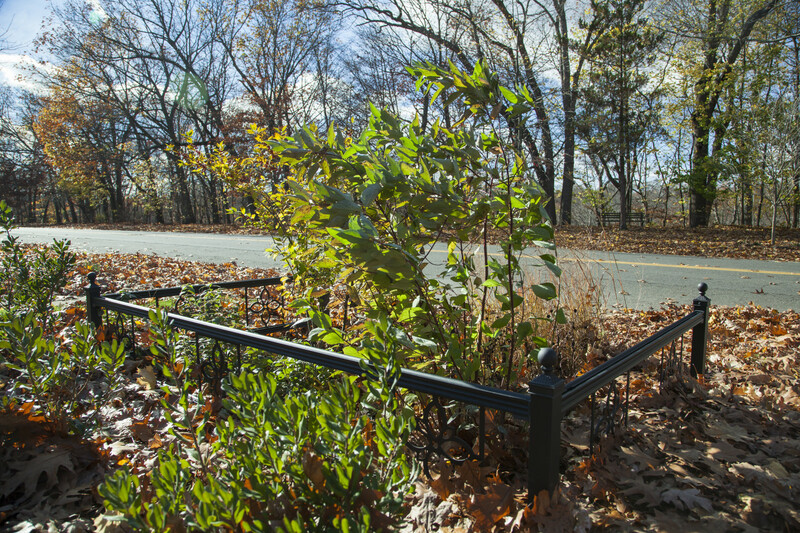 They are an element of New Haven’s recently established green infrastructure, designed to mimic the ways that Earth’s water cycle naturally filters out pollutants. A few blocks away, rain gardens—woodchip-and-gravel lined rectangles filled with shrubs and flowers—dot the roads, diverting water from storm drains and filtering out pollutants. The bioswales are part of a larger initiative put forth by the West River Watershed Coalition, a group of local residents, activists, and government officials trying to heal New Haven’s rivers using methods that rely on cultural change and green infrastructure. The West River Watershed Restoration Plan, which was approved this October, outlines the Coalition’s goals—using green infrastructure projects like bioswales and rain gardens to reduce CSOs, preserving and restoring habitat along the river, increasing flood resilience, and educating the community about the rivers to encourage connection and stewardship. ***When Europeans first founded urban settlements in the New Haven area, early New Haven residents began “using rivers basically as conveyance systems for sewage and other types of trash,” Barbery told me. Eventually, the river and its tributaries became so contaminated that people preferred no waterways at all. As a child growing up in Westville, environmental anthropologist David Casagrande, FES ’95, remembers going down to play in the river, near where the pulp factory where his father worked discharged its waste into the water. Casagrande’s father has childhood memories of collecting the lead dumped by a steak knife factory near the river and melting it down into toys. As the public’s understanding of sewage and the importance of clean water has evolved, the conditions of the rivers have improved over time. This change was largely catalyzed by the Clean Water Act, which Connecticut passed in 1972 and introduced regulations for water polluters and water standards. Recalling the pollution in the nineteen-seventies as its worst ever, Mushinsky notes the drastic improvements all three New Haven rivers have made since then, largely due to the Clean Water Act. Fish populations, for example, have rebounded. Now ospreys and bald eagles nest along the Quinnipiac River. On a good day, an average of forty million gallons of sewage end up in giant covered tanks whose contents aren’t visible from above. But as suburbia has encroached on the undeveloped areas, Mushinsky says, so too has the amount of impermeable surfaces—sidewalks and streets—that create runoff to the rivers. And while the rivers are no longer streams of sewage and trash, parts of the river and its tributaries remain practically cut off from human access, generating indifference to them. As a result, the river’s health suffers, and New Haven residents don’t know they are being robbed of their waters. The abatement facility, which processes waste and sewage for New Haven, Hamden, East Haven, and Woodbridge, is surprisingly picturesque, once you get past the primary treatment process and the sludge, and before you get to the incineration room. It’s situated on the shore of Long Island Sound, and surrounded by groves of trees that cut it off from the nearby residential areas. The first time Zrelak and I speak over the phone, it’s raining. He mentions that tonight will be one of those nights when the pipes overflow into the river, which makes the sound of rain on my roof a little less enjoyable than usual. On rainy days, when the pipes are over capacity, they are designed to release untreated sewage and storm water right into the river. The forty million gallons of sewage (the daily average, although it can increase by 100 million gallons on rainy days) that do make it to the treatment plant end up in giant covered tanks whose contents aren’t visible from above. They make their presence known by their smell: the solid waste is first filtered out of the sewage, leaving “grey water” that travels out through secondary treatment. As it begins the bacterial treatment processes, the air begins to take on the not-quite-pleasant but not-quite-repugnant smell of living mud. By the time it passes through clarifiers and is disinfected with chlorine, it is clear. The solid waste, meanwhile, takes a different path. It ends up in the massive, multistory incinerator where the solid waste circulates and burns. As I peer into the incinerator’s flames, it occurs to me what challenges environmentalists contend with: often, the tradeoff for one problem brings another: we (mostly) no longer dump raw sewage into rivers or the sound, but sewage treatment creates some significant pollution if its own, including the air pollution caused by incineration. By using green infrastructure, the coalition may be able to solve the problem, at least for CSOs, without making that trade. To make people care before the real storm comes, they are investing in useful prettiness: the flowers that can compete with the urine stench, and the woodchips that stave off rainbow-colored pollutants. Supporting the existing combined sewer system with green infrastructure requires less time and money than deconstructing the current system to rebuild two separate systems. Separating the sewage and storm water system would theoretically involve tearing up the streets and installing another system of pipes that carry storm water only. While the GNHWPCA has a long-term plan to control CSOs, it will take decades. And, even then, the storm water runoff will continue to pollute the bodies of water into which it flows. Instead, the coalition plans to eliminate sewage overflows by stopping storm water runoff from reaching the pipes in the first place. As the city of New Haven has become more and more developed, the runoff has increasingly become a cause of pollution in the river—both because it causes sewage to overflow, and also because it is polluted. Small-scale innovations like the bioswales redirect the storm water runoff through natural means towards the major bodies of water. 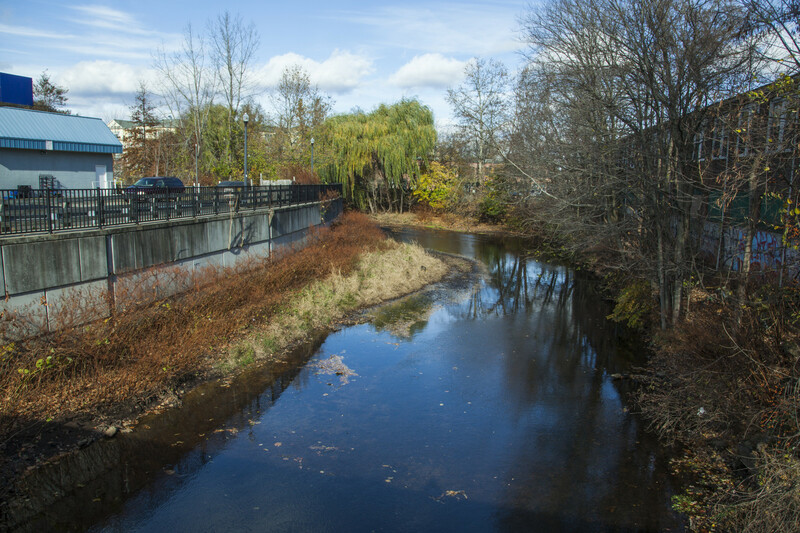 While pristine at its source, the West River grows increasingly polluted as a result of increased pavement and streets that block the re-absorption of storm water. Forty percent of surfaces in the lower watershed are impenetrable, far above the threshold level of twelve percent—the level at which local rivers begin to see degraded water quality as a result of storm water runoff. Unable to be absorbed into the soil, the storm water flows into the river, bringing pollutants with it. The river, unsurprisingly, suffers, as does Long Island Sound, into which West River ultimately empties. To extend conservation efforts beyond the bioswales and urban gardens, members of the coalition have gone house to house asking watershed inhabitants to disconnect their downspouts, which carry storm water directly from roofs to rain gutters. Local environmental activist Lynne Bonnet, who helped bring together the group that became the coalition, is working on gathering and distributing rain barrels, to help people store storm water on their property until the storms have cleared and the system is no longer overcapacity. The hope is that, when implemented on a large scale, smaller treatment measures could eliminate runoff into the rivers altogether, and pave the way for a more sustainable water management system. In addition to small-scale intervention, the coalition intends to reinvigorate community connection to New Haven’s bodies of water. As demonstrated by the coalition and its members, when people feel connected to the rivers, they work to improve them. Currently, much of the river and its tributaries remain blocked by either steep banks or private property. Improving access will hopefully further entrench community commitment to improving the water’s pollution. So far, the coalition is working to create an unbroken walking path along the West River, given it recently received greenway designation. At Common Ground High School, students are working on ways to increase access to Wintergreen Brook, a tributary of the West River that runs by their campus. Already, the West River Watershed coalition has succeeded in bringing together a diverse group community members—including people who live in the Mill and Quinnipiac watersheds—and uniting them around the rivers. The plan provided them with a vision of how to achieve a New Haven where green infrastructure, cultural changes, outreach, and habitat restoration restore the rivers to their natural state and effectively manage both sewage and storm water. Now, they’re deciding where to start.